Including more whole, unprocessed foods—that’s the idea behind this eating style. Move over low-fat and low-carbohydrate diets, and make room for the plant-based diet, the new catchphrase for a healthful dietary pattern. The term is turning up everywhere—from its mention in the Dietary Guidelines Advisory Committee (DGAC) report to former president Bill Clinton’s CNN interview about his latest healthful diet. Organizations such as the American Institute for Cancer Research and the Mayo Clinic are all advocating the health benefits of adopting a plant-based diet pattern. So what exactly is a plant-based diet, why might you recommend it to your clients and patients, and how can you help them implement this dietary shift? Although the term “plant-based diet” has not been officially defined and is often considered to be vegetarian, the DGAC calls the plant-based diet one “that emphasizes vegetables, cooked dry beans and peas, fruits, whole grains, nuts, and seeds.” It’s a manner of eating that allows animal food sources to give way to more plant food sources. Thus, it might have different meanings to different people. Clinton’s plant-based diet features primarily legumes, vegetables, and fruit. He even switches out dairy for almond milk. For others, following a plant-based diet might be a more gradual process of including more plant foods and shifting away from the traditional Western diet that is high in meat, fat, saturated fat, and sodium and low in fiber. It’s a simple idea that doesn’t require complicated instructions to promote good health—people just eat more whole, unprocessed foods that come directly from plants. The health advantages of a plant-based diet are plentiful. “The general benefits of eating a plant-based diet include that it is probably lower in cholesterol and lower in saturated fat, depending on food choices. It may be lower in calories, and if you eat more fruits and vegetables, it may be higher in fiber, which may help lower cholesterol levels and help with heart disease prevention. It may also be higher in potassium and lower in sodium, which can help lower blood pressure,” says Nussinow. Karmeen Kulkarni, MS, RD, BC-ADM, CDE, director of scientific affairs for Abbott Diabetes Care, presented the latest science in support of plant-based diets in “The Role of Plant-Based Diets in Hyperlipidemia, Weight Loss and Diabetes,” a session held at the 2010 Food & Nutrition Conference & Expo in Boston. “Results of an evidence-based review showed that plant-based diets reduced the risk of ischemia, hypertension, and type 2 diabetes; lowered LDL and blood pressure; reduced body mass; and reduced overall cancer rate. Risk of chronic disease reduced due to decreased intake of saturated fat and cholesterol and increased intake of vegetables with more fiber and phytochemicals, nuts, and soy proteins,” said Kulkarni, who went on to report that a review of the scientific literature showed plant-based meal plans are an acceptable and effective strategy educators can use to improve diabetes management and lower the risk of complications from the condition. “Carbohydrates are the largest source of energy in the diet for most populations. Sources of carbohydrates have been from plants in the form of complex carbohydrates that are high in fiber. Carbohydrates are consumed as a major part of a traditional diet, making up 80% to 90% of the diet. They are associated with decreased LDL and total cholesterol and decreased risk of diabetes and obesity,” said Kulkarni. She stressed that long-term cohort studies showed whole grain consumption lowers the risk of both type 2 diabetes and cardiovascular disease, and nuts, viscous fiber, soy protein, and plant sterols reduce serum lipids. Plant-based diets are even linked with environmental benefits. According to an October 2010 scientific report from the Barilla Center for Food and Nutrition, foods at the base of the food pyramid, such as fruits, vegetables, bread, pasta, and whole grains, have a lower impact on the environment, while foods such as meat, poultry, fish, dairy, and eggs have a greater impact. While it may seem there is no downside to shifting toward plant-based eating, doing so certainly poses some challenges. One key challenge involves cooking, an activity that is already waning in many household kitchens across the United States. “Cooking meat is easy. You can just throw it on the grill and dinner is ready. Vegetarian eating can take more time; there can be more preparation and chopping. A big challenge is learning to change cooking styles. People may have been cooking this way their whole lives,” says Mangels. And don’t forget the old cliché that vegetarian eating is about as hip and tasty as munching on alfalfa sprouts and granola. Sure, vegetarian eating has come a long way, thanks to a long list of vegetarian celebrities. But that old stigma still holds true for many people. How can RDs help guide people toward plant-based eating? As nutrition professionals, you certainly have the skills to handle the task, but you might have to try a few different approaches. “It’s important to find things that will move a particular person. You have to acquire knowledge about what buttons to push for a particular person,” says Mangels. 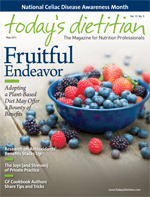 “If you, as an RD, don’t know a lot about vegetarianism, join the Vegetarian Nutrition Dietetic Practice Group. Take a look at the website, see resources, refer to Meatless Mondays [www.meatlessmonday.com], and learn. Find resources that you can help people with,” says Nussinow, who recommends Becoming Vegetarian: The Complete Guide to Adopting a Healthy Vegetarian Diet as a great tool. Additionally, Nussinow finds The Vegetarian Resource Group, Physicians Committee for Responsible Medicine (PCRM), Vegetarian Times, and VegNews to be helpful resources. 1. Start slow. For people who eat animal protein three times per day, starting to choose more plant proteins represents a monumental shift in behavior. “It’s important to look at where you are; you may choose to eat vegetarian one night a week to experiment,” says Mangels. The Meatless Monday program offers recipes and cooking tips. “People can eat one meatless meal or go meatless all day,” adds Nussinow. 2. Rethink breakfast. “Why do you need to eat meat at breakfast?” asks Mangels, who suggests eating a vegetarian meal in the morning. With so many breakfast foods from which to choose, such as oatmeal and other whole grain porridges, whole grain breads and quickbreads, fruits, juices, and even vegetables—baked tomatoes, sliced cucumbers, and sautéed asparagus—people don’t have to rely on meat at every breakfast. 3. Change your mindset. It takes a real shift in thinking to start planning your meals around grains, fruits, and vegetables instead of meat. “Get out of the ‘it has to be meat’ mindset; you can have something like hummus as a plant-based food at a meal or snack,” says Nussinow. People can even cut down on the amount of meat they consume at one meal by taking one individual portion of meat or chicken and using it to flavor an entire family-size meal of stir-fry, casserole, or stew. Meat does not need to be the center of the plate at every meal. 4. Make it simple and delicious. There’s a common misperception about the vegetarian diet: It’s laborious, complicated, and bland. “Try dishes like lentil soup or vegetarian chili. People think that they can’t go meatless because they think that they have to eat a nut loaf. But it can be simple and delicious,” says Nussinow. People can easily convert their favorite dishes—from lasagna and tacos to spaghetti and chow mein—into vegetarian family favorites. “You can replace chicken with black-eyed peas or eat bean burritos; it’s pretty painless,” adds Mangels. 5. Invest in a good vegetarian cookbook. Our experts stress the importance of owning at least one good, simple vegetarian cookbook. A cookbook can give home cooks valuable ideas for putting together simple, delicious meals. “Rely on cookbooks to identify dishes that you can easily make meatless. Try new recipes every week,” says Mangels. 6. Get inspiration from restaurants. Order vegetarian meals at your favorite restaurants and then try to reproduce them at home. Mangels suggests turning to ethnic restaurants to find inspiration for preparing delicious vegetarian meals at home. From Indian to Thai, delicious vegetarian dishes may be found in nearly every ethnic cuisine. 7. Think positive. Instead of thinking about all of the things you can’t have at a vegetarian meal, think of all the things you can have: a rainbow of delicious fruits, vegetables, grains, legumes, nuts, and seeds, emphasizes Mangels. Pile up your plate with lots of servings of these delicious plant foods. 8. Make one dish go a long way. One way to make vegetarian cooking simple and delicious is to rely on more one-dish meals, according to Mangels. Try chili, stews, casseroles, stir-fries, and pasta dishes filled with whole grains, legumes, tofu, and vegetables. A Crock-Pot is a great addition to a plant-based eating style. 9. Transition from “fake” to “real.” A typical assumption is that the only way to navigate plant-based eating is to pop a soy-based meat substitute in the microwave at each meal. But one look at the ingredients label will give people a clue as to how highly processed these products can be. However, these products can serve their purpose. “When you’re shifting from a meat-based diet to a plant-based diet, people often go through a processed food period, where they eat ‘fake’ meats such as soy-based meat substitutes. The goal is to eat ‘real’ food, but if it works as an in-between stage to get people away from a meat-based diet, then people should do it,” says Nussinow. Note from editor: This recipe contains dairy, but the article is about shifting toward a more plant-based diet, not about going vegetarian or vegan. And keep in mind one of our expert tips for encouraging plant-based eating: Start slow! Preheat oven to 350˚F (325˚F if using a glass pan). Lightly spray a 9- X 13-inch baking pan with nonstick spray. Place a large skillet or sauté pan over medium heat and add oil. When oil is hot, add onions, herbs, and 1/2 teaspoon salt. Sauté over medium heat for about 8 minutes or until onions are soft. Add mushrooms and remaining salt. Sauté for about 5 minutes. Then add asparagus, cover, and cook for about 10 minutes longer over medium heat. Stir in garlic, sherry, and lemon juice. Cook, stirring, for just a few minutes longer, then remove from heat. Grind in black pepper. Distribute bread cubes evenly in prepared pan. Spread vegetable mixture on top of bread, being sure to include all of the liquid. Combine eggs and milk in a blender or food processor and whip until smooth. Pour the liquid mixture over bread and mushrooms and let it sit for about 5 minutes. Use a finger or spoon to poke bread into the liquid until all of the pieces are soaked. Sprinkle walnuts on top and add the cheese, if desired. Cool for at least 15 minutes before serving. Serve warm or at room temperature with a dab of sour cream, yogurt, or crème fraîche (and/or salsa) on top of each serving, if desired. In a small bowl, combine cilantro, lime juice, and hot pepper sauce. Heat olive oil in large skillet over medium heat. Add onion and cook 3 to 4 minutes, or until soft and translucent. Stir in garlic and cook 30 seconds. Increase heat to medium high. Add squash and tomatillos and cook, stirring constantly, 5 to 6 minutes, or until vegetables are tender. Stir in black beans, salt, and pepper and cook 1 to 2 minutes or until heated through. Remove pan from heat and stir in cilantro mixture. Serve immediately. Combine rice, beans, mango, tomato, and green onion in mixing bowl. This step may be done up to two hours before serving with salad, covered and refrigerated. For dressing: In blender or bowl of mini-food processor, whirl orange and lime juices, chile pepper, cumin, and oregano until chile is ground up. Add oil and whirl to blend. Season to taste with salt and pepper. This may be done up to two hours before serving, and dressing refrigerated. Just before serving, pour dressing over salad and toss with fork to combine. (If salad has been refrigerated, let sit at room temperature for 20 minutes before dressing.) Spoon salad into wide, shallow serving bowl and sprinkle with cilantro. Serve immediately. Notes: If you prefer, use frozen brown rice prepared according to package directions. Cool the rice to room temperature before combining with salad ingredients. A serrano chile gives more heat, while seeding and removing ribs reduces heat. For the least heat, use bottom end of a large jalapeño pepper.